Coach Rod Miller hopes that Cheng can fill a void on both sides of the ball. He may be called on to help in the secondary as defensive backs Tanner Varner and Joe Phinesee were released at the end of the season. Miller found Fen at the Beijing combine and likes his strong, stout frame. He will be called on to supply a push up the middle on the offensive line. Daley hails from Thousand Oaks, CA and played for the University of Hawaii, Standing 6-4, 250. Miller calls Daley a player who just won’t stop. He was given a look by the Falcons. His job may not be easy as has he will have to fill the hole left my Jake Metz who signed in the offseason with the Buffalo Bills. Since coming out of Troy University, Mack has had a distinguished seven year career playing in the NFL with Tampa Bay, New Orleans and Houston. In 81 NFL games he had six interceptions and two touchdowns. He also won a CIF title with Wichita. Coach Miller picked up a lineman who can hold his own on the offensive line and play some tight end as well. Piekarski is 6-4. 310 and currently plays for Cleveland in the AFL. The Lakeville, MN native and St. Cloud State graduate has also played for Lehigh Valley in the National Arena League where he received All-NAL Second Team Honors. 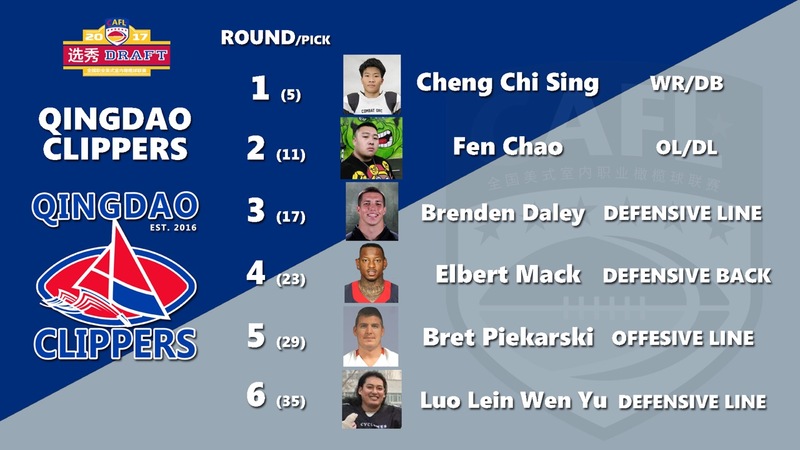 Luo Lei was a find in the Beijing tryout and could be called on to play linebacker as well with the departure of Allium Ailizhati, Shixue Wang and He Shi Lei who were all released at the end of the season.